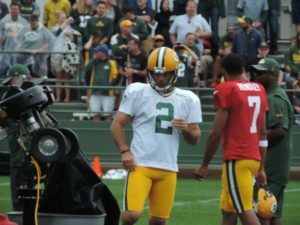 Mason Crosby is once again adjusting to a new long snapper and new holder during training camp and so far, so good. The Green Bay Packers are going with Derek Hart as their new long snapper and new punter Justin Vogel will handle holding duties for Crosby. While the operation needs to be precise, the three have plenty of time and opportunity to get the reps necessary to hit the ground running. That’s what Crosby has done in training camp, hitting 14 of his first 15 field goal opportunities in the first week. Crosby knows the more reps they get, the better things will look. Timing is the big thing and Crosby admitted that trust is a huge factor as well. He has to trust that the operation will be the same every time so he can focus on kicking. Crosby has registered 10 straight 100-point seasons and his 1,267 career points, ranks number one on the all-time franchise scoring list. His list of accomplishments is a long one. And the good thing for the Packers, there appears to be a lot more where that came from.